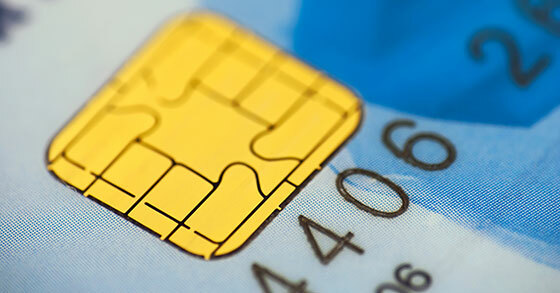 As you go about your day-to-day routine, you may have noticed some new ways to pay; and if you received a new debit or credit card recently, you also may have noticed the new chip embedded in it. Grocery stores, coffee shops, pharmacies, and large national chains all seem to be installing new customer-facing devices to enter your credit and debit card information. For instance, you can now insert your card into a slot on the front of one of these new devices and enter a PIN. The device will read the encrypted information on your card’s chip and pass that information, along with your PIN, to the card processor for decryption and authentication. In essence, you are getting a double dose of security, unlike with a traditional swipe card, whose magnetic stripe data is easily read by any swiper in the event a physical card is stolen or lost. The chip in the new cards comes encrypted, making your data much harder to obtain for any would-be thief. As the cards you currently have begin to expire, replacement cards all will have a chip in them, beginning this year. For a time, they still will have the magnetic stripe on the back, but in a few years that will stop completely. By the end of 2015, an estimated 29 percent of cards in the U.S. will have the chip, and the numbers will grow rapidly from there. All EBT and other government cards issued since the beginning of 2015 already have them. Why should any of this matter to franchisees? One of the things I often see with franchise systems is that they tend to run on limited resources, and many do not have a chief technology officer to keep these issues top of mind. Many franchise systems either don’t require a specific type of payment terminal or they lean on a POS vendor to ensure everything is in place around payment technology and PCI compliance. Neither is a good approach, because there is so much more to the customer data security equation than what any single vendor looks at. Most POS companies are scrambling to meet the October deadline. And even if you are on track to meet this deadline, questions remain. Do you have a plan in place to ensure you are installing the new hardware and/or software in time? Are there cost considerations preventing you from making the upgrades? Do you understand the reasons you need to do this? Maybe this is a good time to to review your POS system in general. To succeed in this transition, you need a comprehensive strategy that includes not only your POS system, payment processing, and gift/loyalty vendors, but also your IT, operations, and maybe even finance. If you have not yet started this process you are already behind. With all the new technology available today, perhaps now is a good time to move to one of the newer tablet-based systems. Most can be installed for about the same cost as upgrading your current POS. If you have to upgrade your systems for EMV anyway, perhaps you should also look at adding NFC (near field communication). NFC is the technology that enables ApplePay, Google Wallet, and CurrentC. This technology is not really new, but Apple’s entry into the game has breathed new life and interest into these payment methods. Consumers are increasingly adopting these methods–and of course the younger your customer base, the more likely they are to want to use this option. My bottom-line advice to you is that time is getting short and you need to move on this quickly. But don’t act rashly. Have a conversation with your department heads, trusted vendors, and FAC. Since you must make changes anyway, make the right changes–those that will carry you years into the future, not just a quick fix you will have to revisit in the not-too-distant future.